From early on paratroopers were considered, and considered themselves, to be an elite within the German armed forces. The climax of their service in World War II was the invasion of Crete in 1941, a victory obtained at such a high cost that there were no more large-scale paratroop drops by the Germans for the rest of the war. This set is as typical as any of the output from Airfix once their format and quality had become established. There are 14 poses, all of which are realistic and well sculpted. Detail is fine, although there is quite a line of flash where the moulds meet that must be trimmed. The uniforms and weapons are largely correct, with everyone wearing jump smocks and paratroop helmets, but the figures are a bit too small for elite troops of the twentieth century. One man is wearing the 100 round ammunition belt only issued to paratroopers, but this has been sculpted with pouches along its entire length, including at the back of the neck, which would have been completely impractical and is incorrect. Also some have ordinary infantryman's ammo pouches on their belt, which would suggest they are for later in the war as paratroopers did not wear such things when they dropped into action. Weaponry looks fine, although some liberties have been taken in terms of positioning of ammo pouches to better suit the sculptor. The prone man in the second row seems to be using the FG42 assault rifle, which despite its name could be fired in this manner using a bipod. However here there is no bipod (detail is poor and it may be folded underneath), so the weapon magically stays horizontal without any means of support (the left arm being tucked under the body). The man about to club someone with his rifle, though well sculpted, is a surprise inclusion. The number of instances where men had the opportunity and the inclination to resort to clubbing each other with firearms must have been very few in the age of rifle and machine gun, so there are plenty of better poses that could have been delivered here. Other than that the poses are an unexceptional but perfectly usable collection. 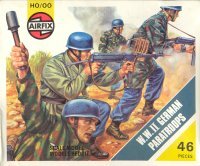 After their successful but costly invasion of Crete in 1941, the famous Fallschirmjäger were mostly employed as elite infantry rather than as paratroops, which could explain why there is no evidence of parachutes in this set. A less easily excused omission is that no one has a sidearm holster, but in general this is a fine and useful set though not a particularly exciting one.